This new ruler cuts diamonds, triangles half triangles. 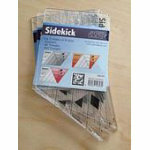 The Sidekick ruler can work together or alone. The shapes and sizes cut from this ruler can work together to make unique and interesting designs.